The University of Tennessee developed a state of the art simulation lab with the acquisition of 40 DentSim units. With DentSim students learn to develop hand-skills and complete operative procedures from the first day of dental school. DentSim gives unbiased feedback and evaluations whenever the individual student requires it as many times as the student needs during a procedure. Students are familiar with many concepts they learn during lectures because of their exposure using DentSim. In the DentSim classroom, each student can work at his or her own pace and does not need to wait in line for an instructor in order to proceed with their practice. 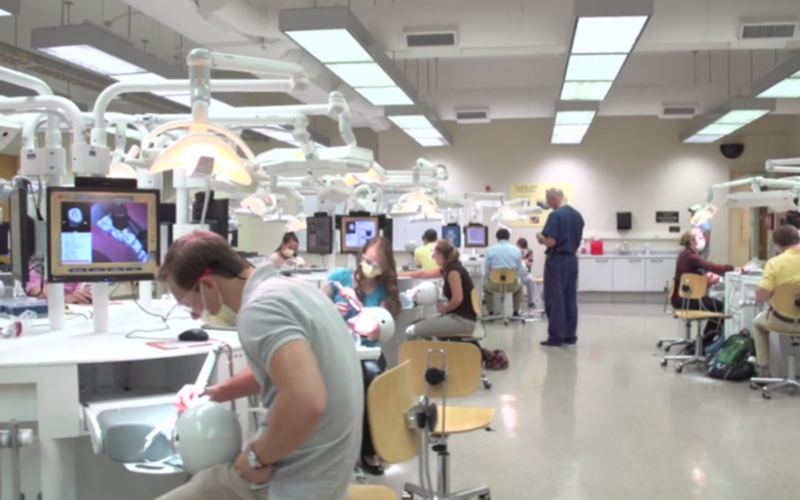 The University of Tennessee, and its students, has seen numerous benefits with the addition of the DentSim laboratory. Students are able to acquire fundamental concepts more quickly with the addition of the DentSim course to the curriculum. Proper ergonomics is learned from the beginning and positive habits are reinforced throughout DentSim training. With the use of DentSim, the faculty are able to be redistributed accordingly. The students in the DentSim lab require less faculty guidance and supervision because of the nature of DentSim and its extensive evaluation system. Therefore, additional faculty may be free to supervise students as they begin clinical work while the beginning preclinical students are in the DentSim lab. The school is able to quickly identify students with hand eye coordination problems or perceptual ability problems and give these students additional assistance to allow these students to acquire the skills they require in order to successfully complete dental school. In this way, the retention of students is maximized, which is of great benefit to the school.